In the last few weeks, Hurricanes Harvey and Irma have been breaking records as they caused devastating damage in the Atlantic. 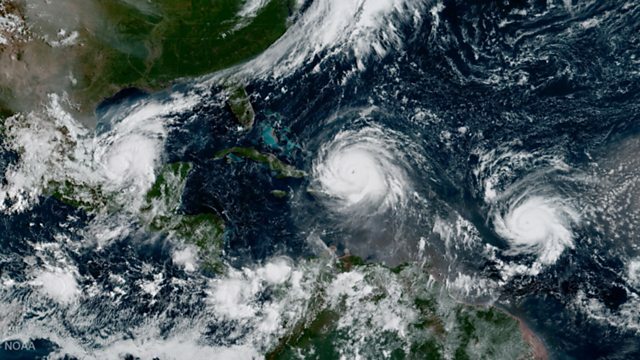 Is there a link between global warming and these mega hurricanes? Looking at data collected over the last decade, the number of hurricanes each season may not change, but it is possible that strong storms will get even stronger. Understanding whether events that appear to be connected are one thing caused by the other, or just simple correlation, or patterns of trends, can be a tricky business. But it’s the key to understanding cause and coincidence. Silvia Lazzaris looks at the weird and wonderfully, spuriously correlated world we live in. Ellen Stofan, former NASA Chief Scientist, shares her opinion on the new nominee for NASA administrator, Jim Bridenstine. She talks about the role of NASA in leading scientific enquiry and its responsibility to exploring space and in building human resilience to extreme weather events like hurricanes.